James Gillray, Very Slippy Weather, 1808. Knight’s in Sweeting’s Ally; Fairburn’s in a court off Ludgate Hill; Hone’s in Fleet Street – bright, enchanted palaces … There used to be a crowd round the window in those days of grinning, good-natured mechanics, who spelt the songs and spoke them out for the benefit of the company, and who received the points of humour with a general sympathizing roar. 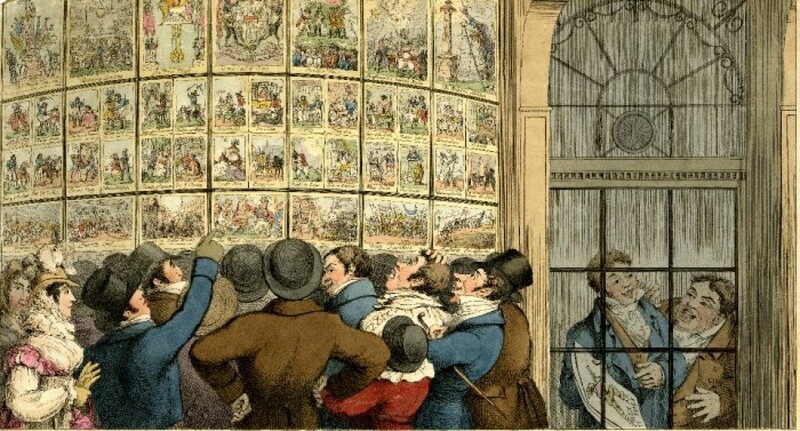 While we shouldn’t take such prints entirely at face value, remembering that they were primarily produced to advertise the wares of the printseller’s whose premises were depicted, we do know that the crowd at the printshop window was a day-to-day feature of life in late-Hanoverian London. But how representative where these crowds of public opinion and did everyone look on the caricature window-display as a source of amusement? The answer to that question is an emphatic ‘no’. The playwright Oliver Goldsmith warned that these crowds usually consisted of pickpockets and other criminals, while other accounts indicate that the numbers of spectators gathered outside printshops in London could often result in traffic jams, fights and other forms of nuisance. Other observers saw them as presenting a far greater and more existential threat to the moral and social health of the nation as a whole. Gentlemen, Caricatures of the fashionable follies of the times have long been the entertainment of the gaping multitudes in this city, witness the number continually crowding about the print-shops to the no small emolument of the pickpocket tribe, who attend upon the occasion. To “shoot folly as it flies,” is very laudable, nor can it be better or quicker represented than in caricatures. The public have given their opinion of them by their general encouragement, and an enormity of fashion seldom escapes without its being held up as a proper object of ridicule; but when those who attempt to expose the follies of others are the promoters of the vice themselves, they stand painted in the strongest colours of an hypocrite, and deserve to be more exposed to public derision than those whom they look upon in a criminal light. I was induced to these observations by the number of indecent prints that exposed in the public print-shops under the denomination of some fashionable dress or amusement, which, while they promote laughter at folly on the one part, they secretly encourage indecency and immorality on the other. As nothing can convey the idea of indecency so strong on the mind of the youth as print, and as there are too many other ways by which it will be conveyed to them, I hope these observations may, in some measure, tend to lesson the growing evil. Men who have acquired a handsome property by the business, have not the excuse of poverty to plead, and consequently the less temptation for the continuance of such an evil. I shall only say, that such men’s names should be held up with as much detestation as the owners of brothels, for a resemblance of an insinuating vice, falls so little short of the reality, that they are equally scandalous; and I expect that some of those gentlemen will spare the trouble of publishing to the world such an unpardonable corruptors of the public morals – such indecent members of society. While it’s amusing to note that the figure of the miserable old git who is horrified by the prospect of young people enjoying themselves has been a constant feature of British society for at least 200 years, I believe that there are also a couple of serious conclusions that we can draw from this source. Firstly, that contemporary audiences were aware of the shifts in satirical print culture which were taking place in this period. 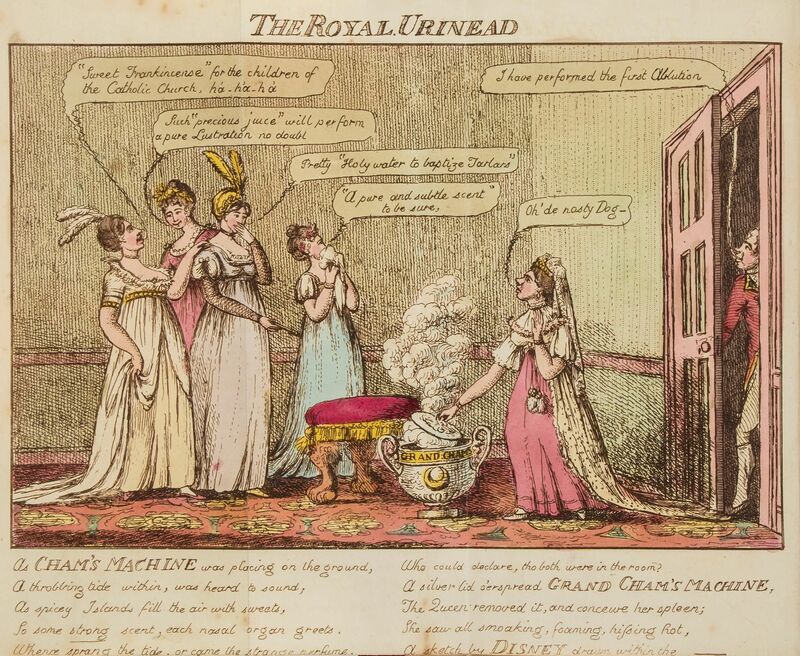 The author opens his complaint by praising the capacity of satirical prints to impart moral messages through humour, but attacks the appearance of newer forms of print which seemingly celebrate vice or excess. 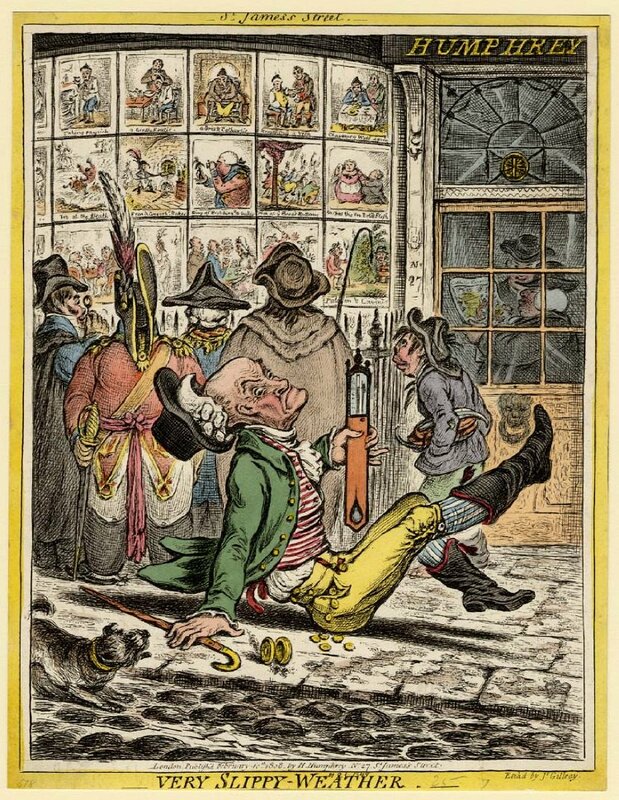 He is in effect complaining about the decline in the old tradition of Hogarthian morality satires which had been taking place from the 1770s onwards, and the rise of the more exaggerated and ephemeral style of caricature which could characterise the age of Gillray. Secondly, the letter may constitute further evidence of the satirical print’s capacity to directly influence popular forms of culture. The author’s suggestion that prints implicitly encouraged immoderate behaviour does not seem entirely far fetched when one weighs it up against other contemporary accounts inidicating that fashion caricatures may have actually influenced the way that some women dressed. Finally, it also provides a nice reminder of the fact that London was not the only city capable to supporting a healthy and active market for satirical prints in this period. The nature and extent of the trade in Dublin and the its relationship with the other constituent part of the British Isles, remains an area in which little serious research has been done.